I also managed to get several exercise sessions in since the last post (I think publicly telling y'all I wanted to lose weight helped with my motivation ;) ). I did several workout sessions from the Nike Training Club app I downloaded onto my iphone. It's got tons of workout sessions doing High Intensity Interval Training that I can do right in my living room! I love that it has videos showing me the exercise moves and the countdown/timer feature! My friend Clara also sent me the NYTimes article on mindful eating. So I'm also now trying to very consciously, mindfully, thoughtfully, eat. The idea is that really focusing on the experience of eating the food will make you enjoy the food more (Hong, Lishner, Han, & Huss, 2011), and it will help you eat more slowly and pay more attention to your bodily signals that you're full. It's a tough one though because I tend to be working all the time, so eating has typically been something I multitask, but I'm going to make a concerted effort to pay more attention to my food while I'm eating it (and before and after). Yup. I'm still wearing bright colors! 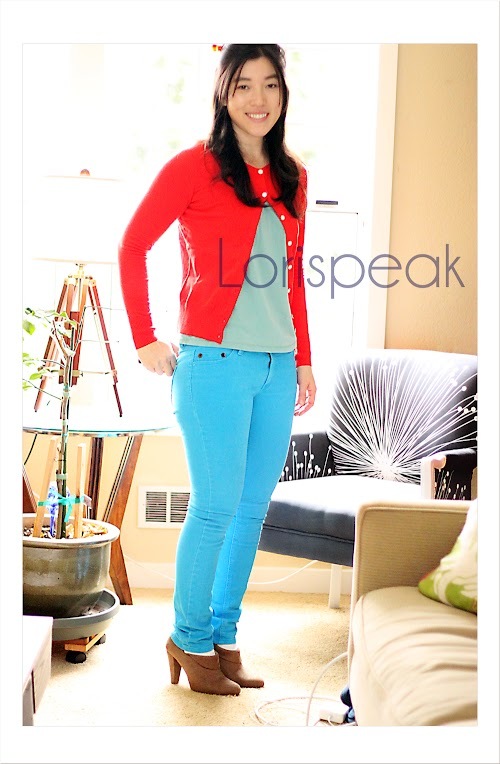 I can't remember if I mentioned how much I love LE Canvas Heritage Cardigans. They're a fabulous slim fit, come in a bijillion different colors, and when you catch them on sale, they're an amazing bargain. I only wish they made the same style in wool as well as cotton for added warmth during the winter. 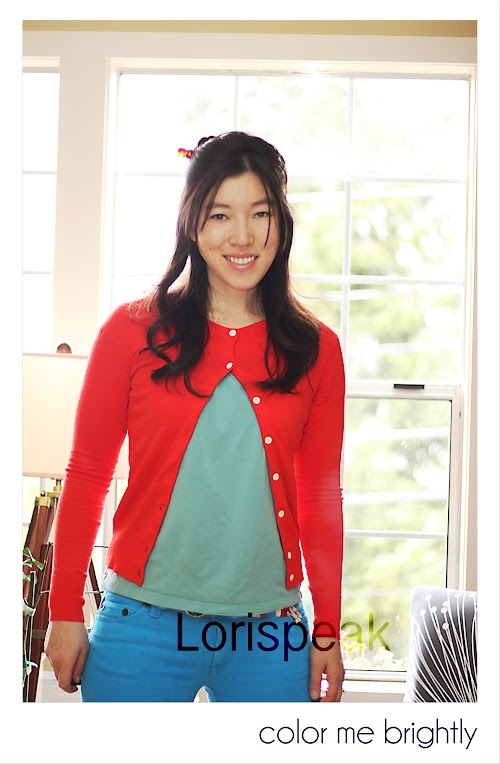 I wore this over the weekend to run errands and then to an early Valentine's Day dinner with Evan. 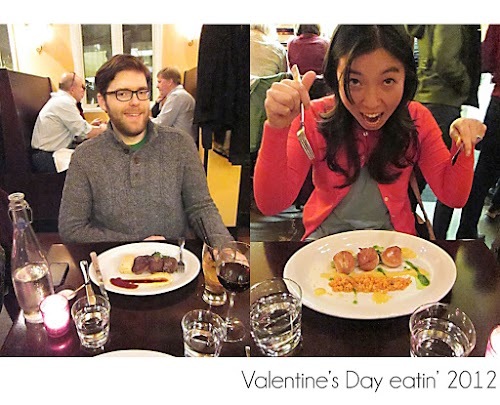 It's hard for us to go out to dinner during the week, so when we heard one of our neighborhood restaurants was offering their Valentine's day prix fixe dinner Friday through V-day, we scheduled a nice weekend meal. Love the brightness and the new hairdo. How did you tie your hair with the pin? It looks so elegant and Chinese :-) I'd love to learn how to do that. @Inkmark thanks so much! Admittedly my hair was a bit of an afterthought in these pics. It was still semi-curled from the day before, so I just pulled the top half of my hair up, twisted it into a mini-bun shape, and secured it with a tortoise colored beak clip I got when I was younger (like this one, although I think you might be able to find cheaper ones at your local drugstore). I also just found a video of some different hairstyles to try with a beak clip. The first look she does looks similar to what I did, except I only used the top half of my hair and one beak clip at an angle to hold the hair in place. And here's another example of someone using a beak clip with her hair half up. I think this also looks very sleek and would look great with your hair!